Late 19th century rural house, restored, on two floors. It is an old rural house, well equipped, where we too often go to rest and relax. It has got two floors: at the ground floor there’s a kitchen with a fireplace, a living and sitting room and a bathroom with a bath-tub. At the upper floor, there are four bedrooms and another bathroom, with a shower. 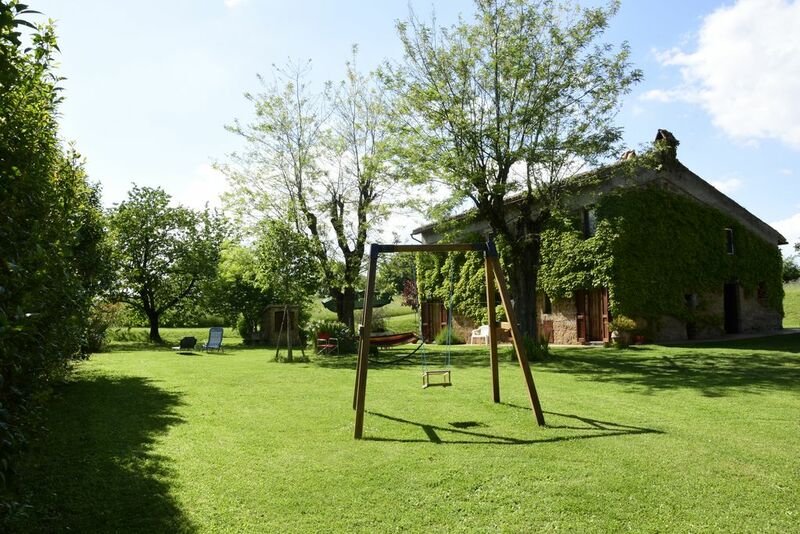 It has got a wide garden all around and about three hectares of not fenced farmland. There is garden furniture to sit and eat outside, a big umbrella for shade, a hammock and a swing for children. There’s a barbecue too, and a little wood oven on one of the external walls of the house, very good for pizza and bread! It was my granny's house in the countryside. We spent there many weekends, with friends and guests or just working to restore it or....because in the country you always have something to do! We have preferred to keep the typical features of the old farmhouse . There is a large fireplace in the kitchen and a small wood oven in the outer wall of the house, where several times we have tried to make bread. It's not suitable for wheelchairs, unfortunately. THe prices depend on the season and on the number of persons. THose showed are up to 4 people. Extra person € 5/ night. Heating is NOT included an will be paid at the end of the holiday, according to the use, at the cost of € 4 per mc. The keys will be provided by the owner at the arrival. We were four friends staying in the house and loved every minute of it. There is plenty of outdoor space, an oven where we made pizza, a huge chestnut tree, fig trees. The beds were comfortable and the rooms cosy. A true Italian Countryside experience. My family enjoyed our stay in Lubriano, not as close to the village as expected; and we never found the beautiful water scenes depicted on the website. The price was good and the owner a lovely person. The cherry tree produced lots of delicious fruit for us. We would return to this property. Hi! I'm happy you enjoyed your holiday at Casale della nonna. As for the water scenes, they refer to the Lake Bolsena and to Bagnaia, Villa Lante, as I wrote in the captions of the pictures. They are two places in the area that are really worth to be visited. Maybe in the anerican version of Homeaway they weren't translated and that caused confusion.. I'll check it . Very lovely house whit big garden, house was clean and well equipped, Owner was very helpful and nice. We enjoyed our stay. House stays quit cool even the out temperature was over 32 C. So over all very happy. Happy you enjoyed your stay in our house! "It's a lovely house with a garden in with the children could play. The bedrooms are nice, the bathrooms clean and the living comfortable. When we arrived late in the evening we enjoyed a warm welcome by the owner. The beds were ready and the house had a comfortable temperature, which we appreciated very much. The owner enthousistically informed us about the tings to do and see. We had a very nice stay." From 19 June till 9 July 2004 we spent our summer holiday in the country house in Lubriano of Emi(lia) and Sandro Meschini. We have been to Italy several times and it is always a challenge to find a quiet and nice place with a lot of privacy. Well, this property offers it all. Right from the beginning Emi and Sandro gave us the comfortable feeling of having made the right choice. Their generous hospitality, willingness to help and enthusiasm certainly contributed to a wonderful holiday. Although temperatures may rise to high levels , the house itself remains nicely cool which helps to ensure a good night rest (like also the good beds do). Thanks to its completeness, we did not miss anything in the house. As BBQ lovers we found it a bit weird to have the BBQ on the street side at a distance from the house/outside furniture. Perhaps something to change in the future? Although Lubriano itself does not offer a lot, it is a good starting base to visit cities like Orvieto, Todi, Rome, Siena, Pienza and Moltepulciano. There are not many restaurants in the neighbourhood, but we can certainly recommend the very nearby restaurant Jovez. Nice and friendly people, no fix menus, but what you get is very good and tasty. Nous avons passé un excellent séjour dans cette maison très confortable loin des grandes villes et de la foule. La maison de campagne de Lubriano of Emi (lia) et Sandro Meschini. est très agréable, confortable avec des grands lits tous moelleux. Les propriétaires sont adorable et extrêmement accueillants. Le lieu est très très calme, la maison à tout le confort nécessaire linge de maison et draps compris. Après nos visites nous avons bien apprécié la zénitude. Mille mercis pour votre accueil. Our house is at the borders between Lazio and Umbria, in the countryside, but not alone, in a very interesting area, from natural, historic and gastronomic point of view. Lubriano is just in front of Civita di Bagnoregio, the so called “dying town” and its suggestive Calanchi valley: an amazing view from the “Belvedere” in the village! It is an ideal starting point for daily trips to the typical villages of Umbria: Orvieto, Todi, Narni, Spoleto, Assisi, Perugia, etc.and of Tuscany too, with the old towns of Sovana, Sorano, Pitigliano and the thermal springs in Saturnia. Bolsena is only 13 km far from the house: the small town is full of story (Roman excavations, Basilica di Santa Cristina with the miracle chapel, Rocca Monaldeschi with its museum..) and full of touristic facilities (beaches, boat trips and restaurants). The lake is the largest volcanic lake in Europe. In summer you can swim in it and sunbath along the beaches, all around. The house is 34 km far from Viterbo, the old city of the Popes, with its mediaeval quarters, its fountains and its thermal springs of Bagnaccio and Bullicame, mentioned by Dante too in his “Divina Commedia”. Viterbo is the main town in Tuscia, a land rich in art, history and nature, tours, festivals and events. Archaeological sites: Etruscan necropolis in Tarquinia, rock necropolis in Norchia, Castel d’Asso and several others. Roman theatre in Ferento. Churches and typical historic centres: Viterbo, San Martino al Cimino, Tuscania, Montefiascone, Vitorchiano, Civita di Bagnoregio, Bassano in Teverina, Calcata. Late Renaissance villas: Villa Lante in Bagnaia, Palazzo Farnese in Caprarola, Monster Park in Bomarzo. Naturalistic environments: volcanic lakes (Bolsena, with its islands and Vico), natural reserve of Monte Rufeno, the Calanchi Valley, the thermal springs in Viterbo and Saturnia. Routes: Via Francigena, a mediaeval route of pilgrims who came from the whole Europe towards Rome, especially around the 11th century. Rome, no need to speak about it…. is only 120 km. You can reach it by car or by train from Orvieto Scalo. Siena is 120 km far from the house, and Florence 150 km. Heating cost is NOT included. When used, it will be paid at the end, depending on the use, at the cost of € 4 per cubic meter. Smoking is not allowed inside the house. Pets are allowed on request. Costo del riscaldamento ESCLUSO: da pagare al termine del soggiorno, secondo il consumo, al costo di € 4 per mc. Non è consentito fumare in casa. Consegna delle chiavi da parte del proprietario.